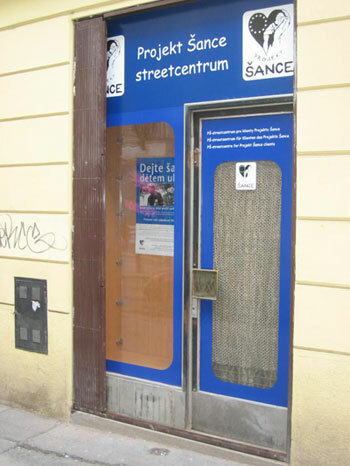 The centre has been operating since 1997 thanks to the support of the City District of Prague 1. The centre is open for clients MONDAY – WEDNESDAY – FRIDAY from 17:00 to 20:00. The centre underwent complete reconstruction in 2005/2006. The centre is equipped with everything clients may need as part of the EMERGENCY ASSISTANCE programme, including replacement clothes and shoes. Some centre services are charged for educational reasons. Clients can pay the above fees from the pay they receive at the WORKSHOP. Prior to reconstruction, the centre ran a GUEST OF THE MONTH programme, as part of which the centre was visited by: Marta Kubišová, Tána Fischerová, Petr Janda, Petr Muk, Michal David, Petr Novotný, Olga Sommerová, Jan P. Muchow, Vlastimil Harapes and numerous physicians, officials and friends of Projekt Šance. Following reconstruction, the programme moved to Dům Šance.